Breaking new ground in macro research, Oxford Economics has captured current and historical statistics on bilateral trade in services for 24 key trading nations to build a unique, comprehensive database. These previously elusive data give us unprecedented insight into the evolution of services trade. Services’ share of total world trade rose from 20% in 2011 to 23% in 2015, as service exports grew faster than goods exports. Outsourcing of intermediate business services to specialised suppliers is driving much of this growth. 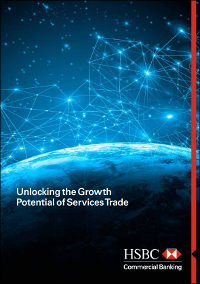 Our projections indicate that services’ share of global trade will continue expanding over the next 15 years, rising to 25% by 2030, with particularly strong gains in business related services. We expect the value of services exported each year to increase by more than 2½ times during this period, from $4.8trn to $12.4trn.